It has been brought to my attention that you have published malicious communications and content regarding me and eight other individuals related to a matter called ‘Sevengate’. Video content has been published on a site (or sites) that you manage under the ownership of Social Media Companies. You also have a number of websites. Our issues are not with you . I am requesting that you remove this content within 14 days of this date – it is defamatory. Should you choose not to I will serve an injunction on the Social Media Companies concerned who will be forced to remove content and be forced to pursue you for spreading malicious content on the sites you own – and it is important, I explain why. Sevengate is predicated on Charles Seven winning a high court case in the UK in 2016. This claim is repeated across numerous sites and hours of video. It is the basis for her claims to have been gangstalked. In fact, the case was struck out and this has been a matter of public record for 12 years. The official record has been forward to appropriate parties. She did not lose, she could not win – the courts decided there was no case to answer. This is not a matter of free speech, opinion or conspiracy – Charles Seven has simply chosen to mislead her followers. 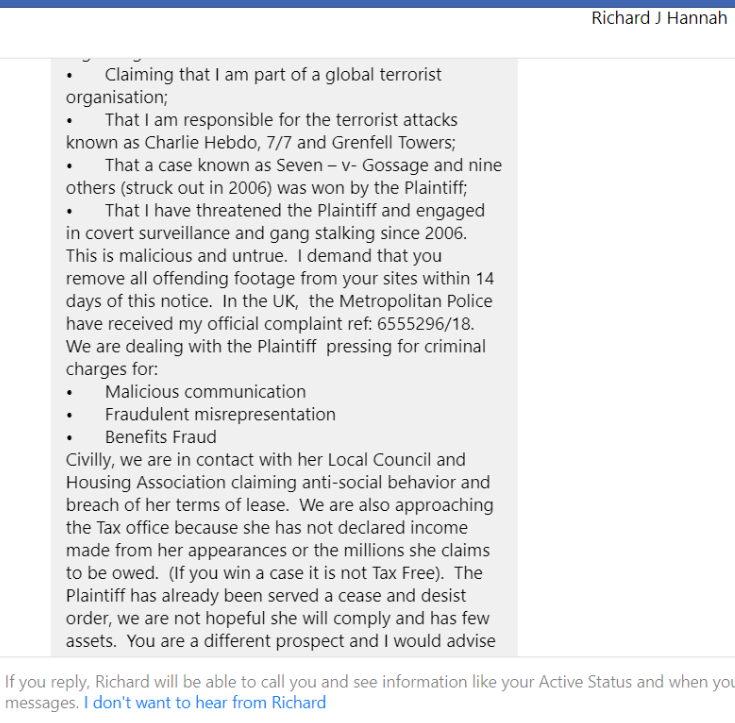 Be aware, that we will also be talking to the Metropolitan Police in London, because we do not know where Ms Seven resides, but we are reporting her incitement to do us harm and falsely accusing us of criminal acts and threats against her person. I was not aware as to the length of time and complexity woven in to the Sevengate hoax, nor the intensity of her fabrication until this year and so it must stop. For myself and my family, the 8 others wrongly accused and the late Judge Pumphrey. It is considered there may be some mental health issues with Charles and although we are not qualified to help, we do believe if we can remove this fixation she will be in a better place to get the help she needs. Please confirm that you are happy to cooperate and put right a wrong perpetrated over 15 years. My interest as an investigative Truth-Focused Reporter in covering an issue of great public-interest derives from publicly available material on Writer, Musician, and Media Concept-Creator and Innovator Charles Seven’s public-interest court case, which draws attention to Extreme Theft by wealthy media groups in the news and entertainment media world of her personal, copyrighted, intellectual property and creative work, an issue of continuing and deep concern to all artists, writers, and intellectuals everywhere. 1. Please be aware that neither Seven nor I are misrepresenting the facts in our video interviews and discussions, which continue as we strive to put the very important and tragic story of her intellectual property theft and subsequent targeting before the public. It is defamatory to suggest otherwise. 2. The full details of Seven’s court case, including Court Audio Recordings wherein Judge Pumphrey stated he “must rule in Seven’s favor” and where I understand a group of defendants including yourself lost the case by default and inability to defend may be found online at htpp://www.thefarrellreport.net. 4. Subsequent to Judge Pumphrey’s untimely death shortly afterward, and the lack of court enforcement of the summary judgment, Principal Intelligence Analyst Tony Farrell of the South Yorkshire Police reported the details of both police and court corruption in Seven’s case as “a state cover-up of monstrous proportions, a story that involves gangstalking, in what I would classify as Domestic Terror, and a monstrous cover up in the Judiciary and in the police service,” a case, also, he said, that provided “insight into the events of the (7/7) London Bombings and the Terror Fear-Mongering tactics perpetrated throughout July 2005 and all the subsequent Cover-up of those monstrous atrocities”: https://youtu.be/2rtqqzfJN_0. 6. The tremendous wrong perpetrated here has been against Seven and her family for over 15 years, as per all court documents, witness statements, affidavits, testimonials, and analyses. I will not be removing any of my videos or articles reporting the injustice and tremendous criminal targeting Seven has faced—a subject of central interest to my reporting, which covers targeting crimes against many—and I advise that anyone interested in understanding the wide-reaching import of this very critical case of Intellectual Property Theft and criminal targeting kindly first peruse all documents, affidavits, court proceedings, rulings, recordings, and reports posted. It is extremely concerning that Seven currently reports online stalking by you: https://www.youtube.com/watch?v=kpO30800lrg. I will indeed be covering this case further. 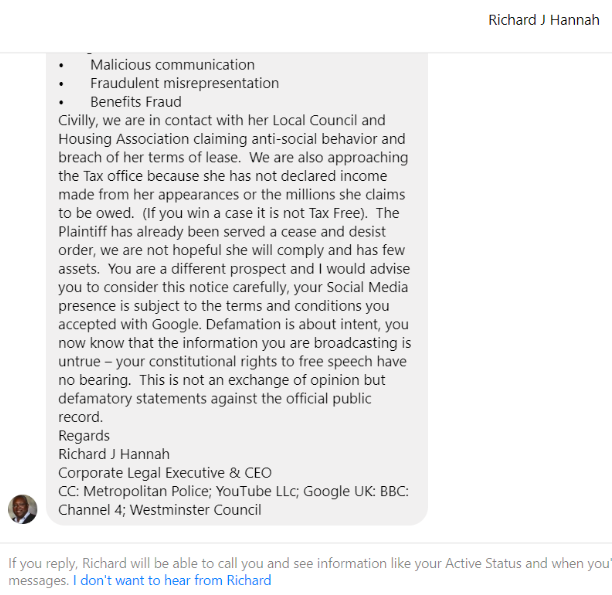 I do not appreciate being threatened, Mr. Hannah, and I welcome the involvement of the Metropolitan Police in exploring the corruption Mr. Farrell describes and in paving the way for enforcement of the judgment in Seven’s favor, returning to her in full the intellectual property stolen from her as well as all monetary proceeds from its unlawful global sale. Far from being “a malicious spreading of content,” my reportage of crimes, cover-ups, and injustice is openly truth-seeking, and my guests—many of whom have experienced great suppression of voice by powerful criminals–are permitted to express themselves. Please be advised I will not be responding further to any comments you choose to post. I reserve the right at all times to remove malicious, hostile, libelous, threatening, or stalking comments from my video channels and websites. To recognize that I am under no obligation whatsoever, to continually address his many outlandish letters and comments and threats which continue to be sprinkled under videos on Youtube and on Twitter and Facebook—despite being blocked on Twitter and Youtube, and that my response to him, as noted in the letter above, is final. 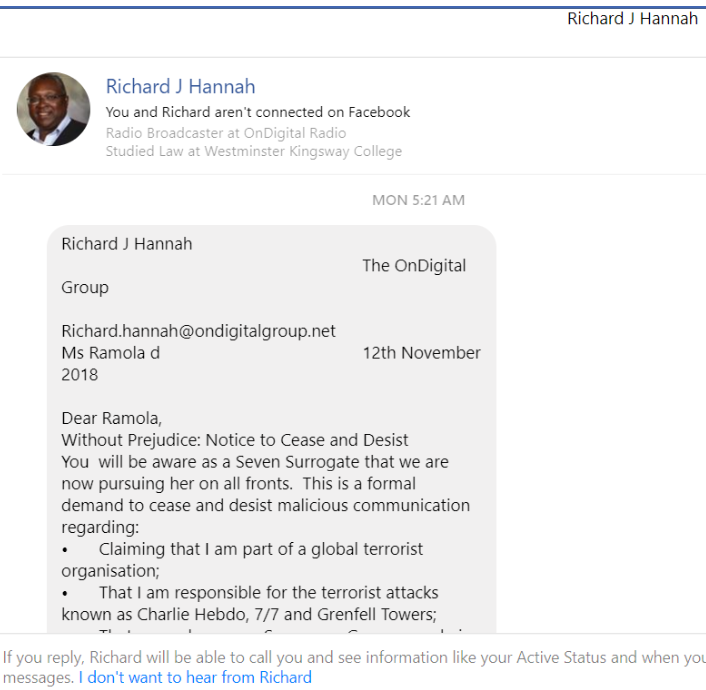 To recognize that I am aware that several other News Media Outlets online who have published Seven’s reports and interviews have also been cyber-stalked and threatened by Mr. Richard Hannah online and that all have examined the court-case documents noted above and agree with the veracity and authenticity of the reportage Seven is presenting, as I do, and that all are participating–along with other impartial Media observers online–in sending Witness Statements and complaints of cyber-stalking and harassment along with evidence of same by Mr. Richard Hannah in this matter to the London Metropolitan Police as I too intend to do. 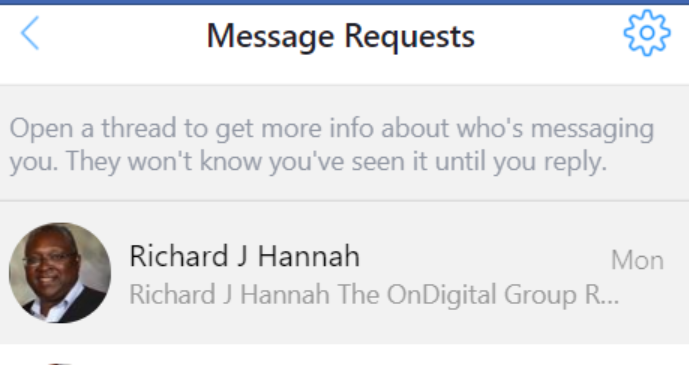 I fully reserve all rights of Free Speech and Free Press and Free Truth-Journalism to, at any time, address this entire phenomenon of Mr. Richard Hannah’s sudden and repeated cyber-appearance at my Youtube channel, my Twitter timeline, and my Facebook Messenger page in print, online, or broadcast media editorial and reportage, and in reports/complaints to Law Enforcement in the UK and the US, as well as to any other International Court of Justice or Truth-Focused judicial institution of my choice, interest, and discretion.